In a statement released earlier today, Mary Walker Exhibitions announced that it would be closing the show after it’s 24 years of running and that the 2013 exhibition was the last. Focus On Imaging has attracted over half a million visitors in its 24 year life span, with the 2013 exhibiton gaining almost 35,000 visitors – 8% down on the previous year. It has not been known if Focus On Imaging has been having any financial difficulty, however it seems that the event was becoming difficult to organise with key photographic companies missing from previous shows including Sony, Samsung and Panasonic. The largest show of this kind in Europe is the bi-annual Photokina, which next takes place in Cologne in September 2014. 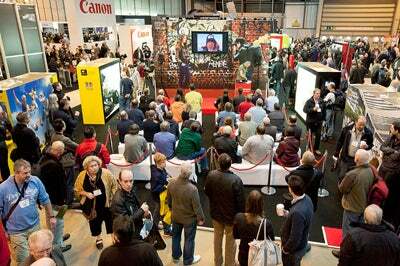 Around 185,000 people from around the world attended the show in 2012. @RCAHMSphoto group noted the shows usefulness: “So sad to see the demise of #focusonimaging It was a great place to see new kit before buying.” @churchill_photo made a poignant, debatable comment “Another blow for the declining photographic industry” after the news was announced this morning. announce that the 2013 Focus on Imaging exhibition was the last. run Focus On Imaging to the absolute best of my ability. to come together professionally and personally over the years.